By Gov. 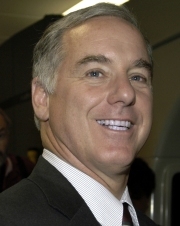 Howard Dean, M.D. the United Nations in a cooperative way to help accomplish a goal most Americans shared, which was to limit the destructive role Saddam played in the region and in his own country. However, I have also said that the U.N. bears a portion of the blame for the Iraq war. The U.N. did not understand that sometimes action is necessary and talk is not enough. There is often too much dithering in the European Union and at the U.N. when action is needed. The shameful reluctance of the European Union to intervene forcefully in Bosnia in order to stop genocide is one such instance. The ultimate failure of the entire world community, including the United States, to stop the massacres in Rwanda is another example. The U.N. does not seem to learn very fast. In Sudan, Africa's largest nation geographically, a terrible ethnic cleansing has been going on for more than a year in the western Darfur region where government sponsored Arabic speaking Sudanese militias have been systematically moving black Muslim Sudanese off their traditional lands. Over one million people have been displaced. Systematic rapes, burning women and children alive, and other forms of murder and intimidation are the preferred methods of the roving gangs called the Janjaweed. These gangs, supported sometimes directly by Sudanese government forces, are burning villages and sending their populations either to mass graves or, for the lucky ones, to foul refugee camps along the border with Chad. This spring, the U.S. pushed a resolution through the U.N. Security Council threatening sanctions on Sudan for their disgraceful conduct. The already weak resolution was watered down at the request of a number of countries, including the Europeans. Europeans cannot criticize the United States for waging war in Iraq if they are unwilling to exhibit the moral fiber to stop genocide by acting collectively and with decisiveness. President Bush was wrong to go into Iraq unilaterally when Iraq posed no danger to the United States, but we were right to demand accountability from Saddam. We are also right to demand accountability in Sudan. Every day that goes by without meaningful sanctions and even military intervention in Sudan by African, European and if necessary U.N. forces is a day where hundreds of innocent civilians die and thousands are displaced from their land. Every day that goes by without action to stop the Sudan genocide is a day that the anti-Iraq war position so widely held in the rest of the world appears to be based less on principle and more on politics. And every day that goes by is a day in which George Bush's contempt for the international community, which I have denounced every day for two years, becomes more difficult to criticize. Now is the time for the world community to act if they are serious about encouraging an enlightened leadership role for the United States. My challenge to the U.N. and Europe is simple: if you don't like American diplomacy under George Bush, then do something to show those of us in opposition here in the U.S. that you can behave in such a way that unilateralism is not necessary. Howard Dean, M.D. and former governor of Vermont, is the founder of Democracy for America, a grassroots organization that supports socially progressive and fiscally responsible political candidates. Distributed exclusively by Cagle, Inc. www.caglecartoons.com to subscribers for publication.